Travelling around Portugal in the spring of 2003 it seemed to us that the country was only half finished. The UEFA Cup was to be hosted there in 2004 and a frantic process of modernisation was underway. Building construction was on the go everywhere and every route we took had a "desvio" or deviation to allow for massive roadworks. We had enjoyed Lisbon, loving its rather rakish run down look, as if it was still recovering from the harsh regime of Salazar and perhaps even the earthquake and tsunami of 1755. We particularly loved the colourful Azulejos embellishing even the humblest of buildings. It seemed a pity that some of the money going into new construction couldn't be used to repair some of this heritage. This trip had a little less walking than most of our other trips but it was with good intentions that we set off from Lisbon. Deciding to avoid the more touristy Algarve area in the south, our route was in a loop - east from Lisbon to the marble towns of the Alto Alentejo, north to the Parque Natural da Serra da Estrela, further north via Braganza to the Parque Nacional da Peneda-Geres, up to the Lima and Minho rivers and then south to Porto. You can't go far in northern Portugal without encountering Dom Dinis a heroic king from mediaeval times. After the land known as Portucale had seen off Romans, Visigoths and Moors, the crusader Henry of Burgundy arrived in 1097 and styled himself 'King of Portugal' (in much the same way as William of Normandy became King of England). The new kingdom now confronted the kings of Galicia, Leon and Castile while continuing the Reconquista towards the Algarve. What emerged from this struggle by 1297 was an independent country within the borders of modern day Portugal. Dom (king) Dinis ruled from 1279-1325, following his father Alfonso III who had stood up to the Church and begun a process of administrative reform. Dom Dinis brought order, prosperity and culture. He also saw the need to defend the borders with Castile and Leon and built or rebuilt 50 strong fortresses along the border. Those built at Estremoz and Braganza are good examples. His foresight paid off as the wars with Castile were not resolved till 1411 when Portugal finally became fully independent. Painted tiles, or azulejos, are a particular feature of Portuguese buildings, both exteriors and interiors. Whole facades of buildings are decorated with these colourful tiles, whether churches, private houses, public buildings or railway stations, gardens, fountains and stairways. Walking down a shabby street in Lisbon you are just as likely to be confronted with the amazing facade of an apartment building as to discover a beautifully decorated church in the central plaza of a small town, or to come upon a modern mural dominating the scene in a business centre or retail establishment. The earliest tiles were Moorish. Al-zuleique is the Arabic word from which the Portuguese azulejo originated. It meant the 'small smooth, polished stone' used by the Muslims in the Middle Ages. From these first tiles, the Portuguese kings took up the idea to decorate the floors and walls of their palaces. After that they were adopted more widely, with the blue and white Delft style flooding the market for a time. An imaginative Portuguese style was to emerge and develop into a more contemporary style. There are geometric patterns, historical scenes, religious storytelling, landscapes, profane or comic scenes and modern works of public art. An excellent museum in Lisbon tells the story of their development and houses many examples of the developing styles. We made Estramoz a base for exploring this area, which is about 170 km east of Lisbon and not far from the Spanish border. It is an area where all the threads of human settlement can be seen - from megalithic dolmens and menhirs, to Roman and Moorish remains, to the powerful defensive structures and domestic architecture of more recent rulers and peoples. The Romans arrived round 59BC, introducing crops, building irrigation systems and establishing towns and cities. The Moors appeared in the 8th century, further developing the irrigation systems and towns and, in their defence against the Reconquista, establishing citadels and fortresses. These defences were later reinforced by the Portuguese kings, particularly Dom Dinis who strengthened the chain of defence along the Spanish border. Evora, shaped by its Roman and Moorish occupations, is one of the main attractions of a visit to this area. UNESCO listed, it is an intriguing place with a Roman temple, Moorish alleys, a circuit of mediaeval walls and some well preserved 16th century mansions. The architecture of the streets is typical of the area - a pleasing combination of white buildings, red tiled roofs and ochre coloured trims. Forty km further east of Estremoz is Elvas, one of Portugal's strongest frontier posts. Its castle stands on Roman and Moorish remains and is one of the best preserved military fortifications in Europe. After being captured from the Moors in 1230 it withstood periodic sieges and attacks over the ensuing centuries. Another of the town´s principal features is the great Aqueduct which was begun in 1498 and completed in 1622. This impressive structure has 843 arches in up to five tiers and some of its towers rise above 30 meters. On the plains near Evora are several sites with menhirs, dolmens and standing stones, among the largest in Europe. Surrounded by shady cork trees these are wonderful peaceful places. Estremoz, 46km from Evora, is a market town and the largest of the, so called "marble towns", internationally known for the fine to medium-grained marble that is quarried here. Nearby Borba and Vila Vicosa are the others. Driving between the towns is like driving through a giant marble quarry. Monsaraz is another beautifully restored white hilltop town, though rather a museum piece full of pensaos and artisinat shops. Portugal is the second largest exporter of marble in the world, surpassed only by Italy. About 85 % of this marble (over 370,000 tons) is produced around Estremoz. It occurs in several colours: white, cream, pink, grey or black and streaks with any combination of these colours. It has been used since Antiquity as a material for sculpture and architecture. The first exports were in Roman times and later the Portuguese navigators exported it to Africa, India and Brazil. There is so much marble around here that it replaces more prosaic building materials and is used everywhere; even the doorsteps, pavements and the cobble stones are made out of marble. It is also converted into whitewash for painting the houses. Mainland Portugal's highest mountain, Torre (1993m), is found in the Parque Natural da Estrella. During the Quaternary period the region was subjected to the action of ice and all the evidence of glaciation is prominent here - horseshoe shaped valleys, ravines, polished rocks and deep lakes are among the formations that demonstrate the importance of the ice and snow in modelling the mountains. Throughout the park, a traditional mountain economy is practised, centred on agriculture, shepherding of sheep and goats. The villages are mainly at the bottom of the mountains and date back to medieval times. There are reasonably well marked and mapped trails and the area is never terribly busy. Many of the best walks start from the town of Manteigas where we made our base. It is in a beautiful location at the end of the spectacular glacial valley of the River Zezere. There are mountains and terraced hillsides all around and a variety of walks. We did a walk to a waterfall called the Poço do Inferno (Hell's Well). It should have been relatively easy but poor signage and indistinct track junctions had us declaring it every bit a hellhole. When we finally found it, however, it was a lovely oasis set in a cool craggy gorge. Other walks take you up into the mountains or along and up the Zezere valley which is a textbook example of a U-shaped glacial valley. With limited time, we drove up the valley stopping frequently to admire the glaciation and the view back down to Manteigas. Rocks deposited by the retreating glacier were strewn about the hillside and there were wildflowers everywhere. The valley floor was very green and dotted with the stone huts used by shepherds. There were not a lot of sheep about at this time of year but down in the town, we saw big mountain dogs ready for their season in the mountains. There were lots of small mountain dogs in the souvenir shops, but surprisingly very few tourists. Somewhere along the way we had seen intriguing photos of Palaeolithic rock engravings at a place called Vila Nova de Foz Côa. We made some bookings to visit the site and discovered an amazing story. The engravings had been first discovered in the late 1980s but in 1995 a plan to construct a dam on the lower part of the Côa Valley was approved and work began. When the extent of the engravings was publicised by archaeologists working in the area, the press, conservation groups and UNESCO immediately began to take action. The electricity authority tried to disprove the age of the carvings so as to continue the dam project, but archaeological investigations were intensified. A citizens group became active and UNESCO formally identified the sites as being from the Palaeolithic. The government came under pressure from the international community and finally in 1995, after a change in government, the dam project was cancelled. An archaeological park was established and UNESCO designated the site as being of World Heritage significance in 1998. The overall site comprises more than 30 locations where there are thousands of engraved drawings of horses, mountain goats, aurochs, deer and other animals, dating from 22,000 to 10,000 years BCE. These species are all typical of the large herbivores that were part of the ecosystem in the region during the Upper Palaeolithic Age. Engravings of fish are also found, along with rare images of human and abstract figures. The engravings were etched using quartz or flint, the images being scratched into the shiny, glaciated rock walls using straight lines or zigzags. Three sites are open to the public and visits are made by four wheel drive in the company of guides from the Archaeological Park. We were so enthralled by our first experience that we immediately booked another tour to a different site for the next day. The engravings were at first quite difficult to see but with explanation, were fascinating. You wonder how they were ever found. Night time visits use special lights to make viewing easier. We found that increasing the contrast in our photos has produced images that are more distinct than our actual viewing. From Foz Côa our route took us north towards the Peneda Geres National Park with an overnight stop in the wonderful town of Braganza which is situated high on a plateau very close to the Spanish border. A town was fortified here by the Romans and subsequently trashed by Christian and Moorish campaigns. It was rebuilt as a semi-independent duchy, ruled for several centuries by the dukes of Braganza, finally becoming incorporated into Portugal in 1640. Braganza has a small mediaeval town centre of narrow streets spreading out from a largish cathedral. More impressive is the very grand and well-preserved citadel. Built in the 12th century by Benedictine monks and reinforced in the late 14th century, it towers above the town. Within its walls are houses where people still live, plus a handful of handicraft shops and cafes. Nearby to the north is the 700 sq km Parque Natural da Montesinho in the heart of Tras-os-Montes' Terra Fria (Cold Land) country. It is one of the least well-known areas in Portugal and is a wild and relatively untouched mountainous area clothed in ancient oak forests and home to various protected species. They include the Iberian wolf. The area was designated a natural park to protect its wildlife but also the traditional culture of its inhabitants. While no formalised walking trails had been established in 2004 there was a network of roads and dirt tracks with advice and schematic maps available from the parks office. This was the first protected area to be founded in Portugal in 1971 and it is the only National park in the country. Having once been the home of the brown bear and the mountain goat, Peneda-Geres is today one of the last refuges of the wolf and the royal eagle. The establishment of the park was also intended to protect the rural way of life. Transhumance is still practiced from the traditional villages which otherwise struggle to survive. The best opportunities for walking are from the towns of Soajo and Gerês. There are several high altitude itineraries and many day walks and maps are available locally. Planning to do some serious walking here we made a base for a couple of days in Gerês, an old spa town of somewhat faded elegance where hotels were strung along a green and very wet valley. It was so wet that, as we looked up into the mountains, all we could see was cloud, so serious walking was abandoned in favour of a stroll along a remarkably well preserved Roman road. The 2 km of road that is open for walking is a small section of a 320 km military road that ran in Roman times between Braga and Astorga, in Spain. Along the route are milestones that define their position and carry an inscription about the emperor who was ruling at the time of construction. Driving around this area and up towards the Lima and Minho rivers we found ourselves in a mountainous agricultural area where the rustic villages had red tiled roofs and names like Brufe. Long horned cows were driven along the roads by old ladies dressed in black and wearing practical gumboots and sometimes carrying loads on their heads. An intriguing feature of the area were the old granaries grouped alongside farmhouses or clustered in villages. They are called espigueiros and are found in this mountain region of Portugal and also throughout Galicia in SpaIn. They are constructed of huge granite slabs sitting on stilts, slatted timber walls and stone or iron roofs and topped with a little cross. Encrusted with moss they look like ancient shrines and are incredibly photogenic. They have been used for generations to store grain and corn and are apparently still used. Tall haystacks shaped like witches brooms stood upright alongside the road. Two big rivers, the Minho and the Lima, mark the northern extremities of Portugal and it was up here that we finally had some clear and fine days for walking. We made a base in the town of Ponte de Lima, an agreeable market town on the Lima river with a multi arched bridge spanning the river. Throughout the town there are remains of the 14th century fortifications that once protected the town. There were lots of good restaurants and one day we discovered a book fair under the plane trees along the river. Architecture in the town, as in much of northern Portugal, is marked by the use of the local granite. The walls are whitewashed and cornerstones, architraves, windows and doorframes all use the beautiful soft colours of the dressed stone. We also loved the interesting decorations and statues that adorned the walls of buildings. There is a story that when the Romans passed through here the soldiers believed that the Lima was the mythical River Lethe. If they crossed the river they would lose their memories. They were only convinced to cross when their leader made the crossing and then called all their names from the other side. It is said that the present day bridge marks the spot, though very little, if any, is left of the original construction. There have been some huge floods over the years and signs throughout the town mark the levels that have been reached. However, the Lima was very tranquil on our visit and the town's washing was hung on lines that were strung along the bank. A helpful tourist office provided walking maps of the area. Although this region is popular with many walking companies we saw no other walkers. One day we did a walk up into the hills following a route up a mountain stream where there were remains of old water mills and, on the hillsides, shepherds kept an eye on their big dogs which, somewhat alarmingly, were muzzled (for our protection?). As we had come to expect the trail was not particularly well marked but it certainly had its rewards as, when we completed a descent through rocks and prickly bushes, we found ourselves in a clearing where there was a lovely old church and a very welcome stone drinking fountain. There are also opportunities for walking along the coast around Viana do Castela and in the estuary of the Minho round Foz do Minho which we were able to briefly investigate on an excursion from Ponte de Lima. This part of the coast is known as the Costa Verde not only because the countryside is lush and fertile but also because it is from here that the celebrated vinho verde originates. This is very young wine, either red, white or rosé, which is light, fresh and slightly spritzy. It does not cellar and is frequently encountered as table wine. Porto was our last stop on this Portuguese circuit. 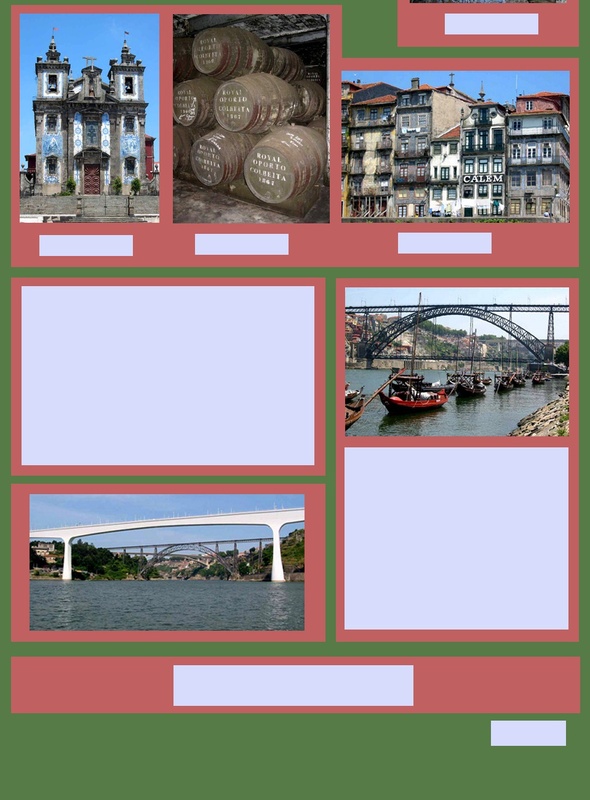 Located on a gorge near the mouth of the Douro, Porto is a city of bridges and port wine warehouses. A cruise along the river under five dramatic high level bridges and a visit to at least one of the port wine cellars are obligatory for the visitor. After these there is much to enjoy in the narrow lanes and passages of the old Ribeira district and along the restaurant lined quayside. There are splendid azulejos throughout the city, on the exterior walls of churches, the cathedral and even the railway station. There are six crossings along a 10km stretch of the Douro in Porto. The oldest is the Ponte Dona Maria Pia built by Gustav Eiffel in 1876-77 as a rail bridge but taken out of use in the 1990's. It has been designated a civil engineering historical landmark by the American Society of Civil Engineers. The next to be erected, in 1881-66, is the magnificent two level Ponte Dom Luis. The plans for this bridge were drawn by one of Eiffel's assistants. This remains in use and you can walk across both levels. The others are more modern, but no less elegant. The Ponte S. Joao is a prestressed concrete bridge dedicated to rail use and the stylish Ponte de Arrabida was, when constructed in 1963, the longest concrete arch bridge in the world. The other two are newer motorway road bridges. Port is quintessentially associated with gouty English gentlemen. But how did this come about? British traders established themselves in Porto in the 13th century but were interested in olive oil, fruit and cork rather than wine, as they had good trade in wine from France. This changed when cloth imports from England to France were banned in 1667 and, in revenge, England's Charles II banned the importation of French wines into England. An alternative source had to be found and shipments of red wine from Porto and Viana began. In the search for better and more reliable quality, brandy was added. By the 17th century Porto had become an established depot and various treaties and business deals guaranteed a dependable supply to the British (and world) market until the second world war. Since then various competitors and changing tastes have transformed the market but sales from the remaining firms in Porto continue. From Porto we caught a train to Santiago de Compostella an account of which is to be found in the page on north east Spain.